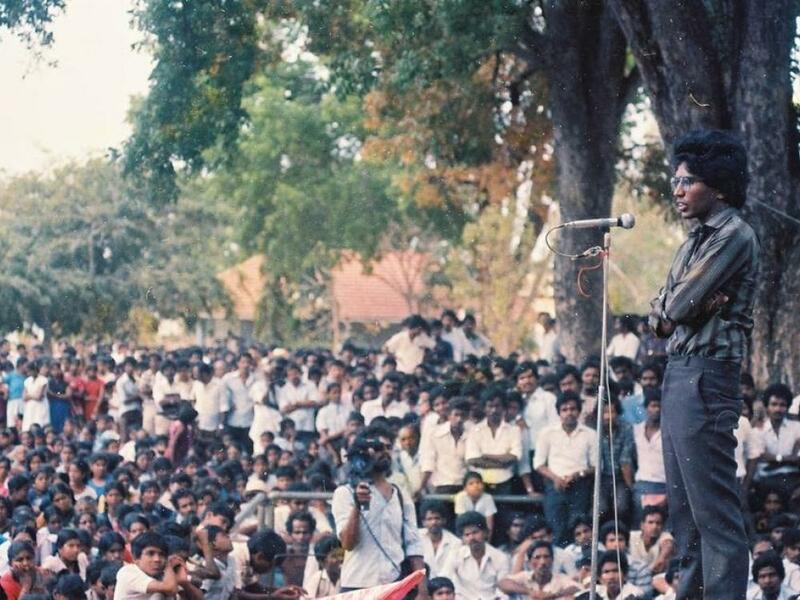 Today marks 31 years since the death of Lt Col Thileepan, a political wing leader of the LTTE who fasted to death, in a protest appealing to the Indian government to honour pledges made to the Tamil people. Thileepan began his fast on the September 15, 1987, with 100,000 people gathered around the historic Nallur Kandwaswamy Temple in Jaffna. As he began his strike he put forward 5 demands to the Indian government. Thirty-one years on, Tamils continue to call for the demands made by Thileepan. See a video of his famous speech below. See an eye witness account of his protest written by Adele Balasingham here. Thileepan addressing the thousands who had come to witness his protest in Jaffna. He passed away after refusing food and water for 11 days. His death sparked widespread grief across the Tamil homeland, with black flags hoisted and thousands of grieving mourners attending his funeral. As per his last wish, Thileepan's body was donated to the medical faculty of Jaffna University. In Tamil, Thileepan's name is preceded with the honorific thiyaga theepam - light of sacrifice. As Jaffna’s political wing leader, Thileepan was a popular figure in the Tamil community and was already renowned for his courage in combat. The LTTE had named a series of medical centres, located both in government and LTTE-held areas, after him. The Thileepan hospital in Neduntheevu was one such centre, and had provided free medical treatment to 12,627 patients in its first year of service in 2003. Thileepan with LTTE leader Prabhakaran during his hunger strike. Born Rasiah Partheepan, in 1964 as the fourth son of a school teacher in Urelu, a hamlet of Urumpirai in the Jaffna District, he took up the name Thileepan when he joined the LTTE. His motivation for joining the Tamil freedom struggle was prompted at the age of ten by the deaths of ten youths in a violent assault by Sinhala policemen on the World Tamil Research Conference held in Jaffna in 1974. At Jaffna University today hundreds of students lit candles and gathered in remembrance to pay their respects to Thileepan. The exact spot in Nallur where Thileepan began his strike was the site of a memorial built the year after his death. The tower was destroyed by the Sri Lankan army after they captured Jaffna in 1996. Despite being reconstructed during the ceasefire period, the memorial was destroyed again in 2007. The remnants of the tower were once again demolished further in 2012. Efforts have been made this year to restore and preserve what is left of the monument, and commemorations have been held everyday since September 15 to mark each day of Thileepan's fast. 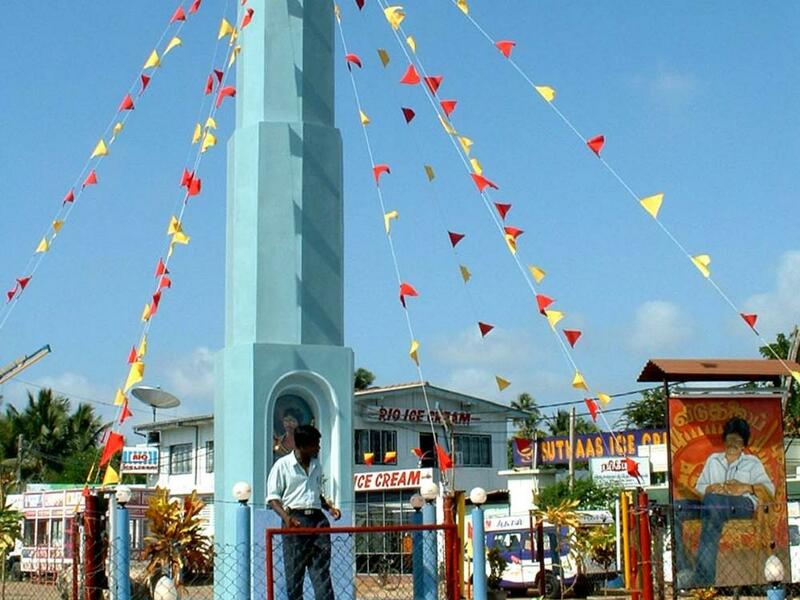 With the monument decorated openly in Tamil nationalist colours and serving as a focal point for commemorations this year, Sri Lankan police sought to ban the final commemoration and to remove decorations with a court injunction. The application was however thrown out by the judge yesterday who deemed that commemorations could go ahead as planned. Crowds gathered this morning and have been gathering across the Tamil homeland over the last 12 days to remember Thileepan. “The sacrifices made by LTTE leader Thileepan, other combatants and Tamil people have laid a strong foundation for the present peace talks. This fact should not be forgotten by anyone… Any political solution to the Tamil national question must recognize the sacrifices made by the Tamil combatants and the non-combatant Tamil civilians to our struggle." See also, the Indo-Sri Lanka Accord and the LTTE's response to it. 26 September 2018 : Thileepan, Hunger and Remembrance: Why Do We Starve? Thileepan, Hunger and Remembrance: Why Do We Starve?